During the March on Washington for Jobs and Freedom, famed contralto Marian Anderson, folk-trio Peter, Paul & Mary, and singer-songwriter Bob Dylan inspired and engaged the crowd with protests songs and folk ballads. In the crowd that day a young photographer from The Daily Tar Heel snapped some images that captured the mood of the crowd. On the 50th anniversary of the March, we take a look and listen back to the music that served as a soundtrack of the day and the images that standout from the crowd. Jim Wallace Photographer; former Director of Imaging and Photographic Services, Smithsonian Institution; photographer, "Courage in the Moment: The Civil Rights Struggle, 1961-1964"
People listening to WAMU 50 years ago heard live reports like this one about the scene on the National Mall. 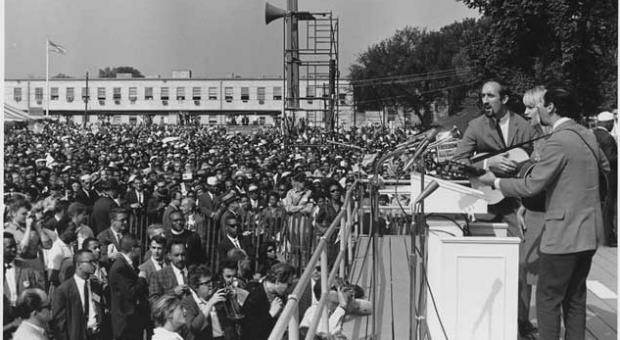 Reporter Malcolm Davis describes the scene where “quite a large crowd is gathered,” and notes the variety of lunch counters and comfort stations. “Most of the people around here seem to be comparatively tired after what has probably been a very long night’s journey from one place or another,” he added. Folk trio Peter, Paul & Mary performed “Blowing in the Wind” on stage. Here’s what WAMU listeners heard 50 years ago at the march. Folk singer Odetta performed “I’m On My Way” at the March on Washington, as heard by WAMU listeners 50 years ago. Ledger Smith, also known as “Roller Skate guy,” who skated from Chicago to the March on Washington. This clip starts with a description of the scene — 100,000 people had arrived at that point — and then goes into an interview with Jackie Robinson. MR. MATT MCCLESKEYWelcome back. I'm Matt McCleskey, sitting in today for Kojo Nnamdi. And we're gonna be talking about the 50th anniversary today of the March on Washington. Of course, many people gathered down on the Mall today as we get ready for events going on this afternoon commemorating the 50th anniversary. People came to Washington 50 years ago from near and far to march and gather on the National Mall. MR. MATT MCCLESKEYThey came for reasons, both intensely personal and much bigger than themselves, to hear of civil rights and labor leaders speak and to show their fellow Americans the way forward. In addition to the speakers, they heard performances from singers who are already legendary and others on their way to becoming icons. And while the lasting images of speakers and performers on the steps of the Lincoln Memorial that day and at the foot of the Washington Monument tell part of the story, pictures of the people in the crowd tell the rest. MR. MATT MCCLESKEYAnd here to talk with us now about what the people who were there 50 years ago saw and heard is Jim Wallace, a photographer and a former director of imaging and photographic services at the Smithsonian. His photographs of the March on Washington can be found in the book "Courage in the Moment: The Civil Rights Movement, 1961-1964." Jim Wallace, thanks for joining us. MR. JIM WALLACEThank you for having me. MCCLESKEYSo glad you can be with us. And you are on the Mall today. First, just tell us, what are you seeing? What's it been like getting there this morning? WALLACEThere is some similarities. I mean, I do not believe that the crowd is as large as it was 50 years ago. I think the weather has probably hurt that some, and I think the intense security to get in has probably hurt that some. But at the same time, the overall attitude of the people -- back in '63, it was a celebration. It was a protest looking for voting rights and public accommodations. But at the same time, there was a feeling almost of the victory was in sight in some ways and it was a celebration. And I feel some of that within the people today. MCCLESKEYWell, how does security compare today to 50 years ago? WALLACEWell, I think that today, the signs, none of which made it through security. But most of the signs are dealing with issues such as D.C. statehood, black business, immigration. You know, there was one group chanting, 2, 4, 6, 8, we want citizenship today. Pass the federal DREAM Act. There is also a large number of teachers from the American Federation of Teachers and other places. MCCLESKEYSo a number of different issues being put forth today. Well, let's go back to the march of 50 years ago because you were there, of course, on the Mall 50 years ago. I understand you went to high school in Falls Church, Va. But at the time of the march, you were on assignment for your college paper. How did you get the job? WALLACEI was brought up in Falls Church. I went to UNC in Chapel Hill. I started working for the newspaper there, The Daily Tar Heel. And between '61 and '64, it was a time of arrests, sit-ins for public accommodation in Chapel Hill. WALLACEThe editors of the newspaper -- we decided that we have a limited number of black students, but that if they could not cross the main street in town between the campus and the town and come to eat in any restaurant with us, that we were going to back the movement as it was developing. We photographed and wrote about the movement all through those years, and I happen to be back home when the march in '63 happened and I came down. MCCLESKEYNow, I understand you weren't able to get credentials on that day to be in the press gallery during the march. So instead, you covered it from the crowd. How did being a part of the crowd that day shape the images you were able to capture? WALLACEI think that because of that -- I mean, the press gallery got wonderful photographs. Photographers such as Flip Schulke and others who had been with Dr. King and traveled with him got wonderful photographs. But there weren't many photographs -- aren't around -- excuse me, there aren't many photographs around of individuals in the crowd. And that was what I was able to capture, and that was basically what we put into the books. WALLACEThe -- and the fact that that's what I did 50 years ago, I decided that that's exactly what I was gonna do today. And so I did not go through security. I have been standing with the people as I'm photographing their signs and talking with them. And I have met probably somewhere between 20 and 50 people who are back here who had been at the march 50 years ago. MCCLESKEYYou mentioned earlier that the 1963 march was also a celebration as well as a protest and that the goal was within sight then. What's the mood that you're feeling today from people gathering on the Mall? WALLACEThey still -- I mean, the struggle still exists, obviously, in many ways. But, again, it is -- there is a feeling of celebration. I have not seen anybody mad. I have not seen anybody arrested. I have not seen anybody scuffling. Everybody is calm and having fun, I guess. It's a strange way to put it. But the overall feeling of the crowd here is one of hopefulness. WALLACEI think, looking back, 50 years ago, none of us who were in the crowd would have imagined that today, 50 years later, there would be two former presidents and a seated president talking to the group. The president never left the White House back in '63. And the public accommodations law hasn't been passed. And the idea of having an African-American in the White House at that time would have been so strange I don't think you could have started a conversation. MCCLESKEYBefore we let you get back to covering today's event, I wanna ask you about one of your images in particular from 50 years ago. It captures two people, a white man and a black woman sitting close together with their feet dangling in the reflecting pool. This was after the crowds had started to disperse that day. I understand that image may soon turn up in a new home on the National Mall. WALLACEThere's a copy of it going into the Lonnie Bunch's Smithsonian Museum -- National Museum of African American History and Culture. And there's a copy of it that is going into the Civil Rights Museum that's being built at the old Lorraine Motel where Dr. King was shot. MCCLESKEYJim Wallace, a photographer and former director of imaging and photographic services at the Smithsonian, I wanna thank you so much for joining us today. His photographs of the March on Washington can be found in the book "Courage in the Moment: The Civil Rights Movement, 1961-1964." Thanks so much for taking the time to speak with us. WALLACEAnd thank you for calling. MCCLESKEYGlad you could join us. Now, in addition to the images from the march, the sounds of that day, 50 years ago, have also become iconic in their own right, of course, the speech delivered by Dr. Martin Luther King Jr. but also some of the music from that day. Let's start by hearing a little bit of the music. This is Joan Baez, leading the crowd in "We Shall Overcome." MCCLESKEYWe'll continue to let that music play. I wanna introduce my next guest. Jeff Place, an archivist with the Smithsonian Folkways Recordings. Jeff, thank you so much for joining us in studio today. MR. JEFF PLACEYeah, greetings, Matt. MCCLESKEYMusic, of course, is an integral part of the civil rights movement as a whole. Where did that connection start, and why do you think it was such a strong one? PLACEI think it was really key to what they were doing. I think it was, you know, the whole non-violent approach to, you know, to protest and their whole movement, the freedom songs were just, you know, it was a binding factor with a lot of people. People who were different ages and grown up in churches and other people, young people kind of rallied around it. It was used to kind of, you know, as people, you know, they used it to inspire themselves. PLACEThere was occasions were people, for instance, the clan would bring like, you know, 500 clansmen and surround them and try to disrupt things, and they would just make a wall of sound and singing. And we kind of completely trumped the clan. They really didn't know how to physically or mentally get through that. It was kind of, you know, a protection mechanism too. It was just totally part of what they were doing. MCCLESKEYAnd some of the songs that have become best well-known during the civil rights movement in the '60s and through today, they're malleable. The lyrics could be changed to fit a particular situation. "We Shall Overcome," I imagine, is one of those. PLACEThat one not as much as others. It was pretty standard. It was the -- that was definitely the anthem. But what you're referring to as I've heard -- I forgot who came up with this term. But somebody called these things zipper songs. You kind of unzip them and you could throw in a topical reference. So one song sung by the marchers and some might be a little different in Albany, Ga., or somewhere, you know, depending on who the players were and issues. MCCLESKEYSure. Yeah. And you could be thereby adapted to whatever the situation would be. Now, we heard Joan Baez there a moment ago. Some of the big musical acts of the day in 1963 who've since become icons on their own, Bob Dylan, Peter, Paul and Mary. How did the inclusion of those artists and the way they're performances rolled out differ from other marches and protests that took place before the March in Washington? PLACEWell, I mean, there was a lot -- the folk movement people, you know, came out of this topical song movement in New York City. And certainly, they rallied behind the civil rights movement. That was a big thing and came down and Phil Ochs, Baez, Dylan, lots of people. Pete Seeger especially came down and helped, you know, join in the rallies. A lot of these songs, you know, one interesting story coming to the folk movement was -- there is actually a really key thing. PLACEThere was a place called the Highlander Folk School in Tennessee -- Monteagle, Tenn., where a lot of like King and a lot of the people who became the Freedom Singers went and spent time there and learned a lot of old union songs since have been used in union struggles with coal mines and textiles, and they kind of got reworked. MCCLESKEY...a labor element involved, correct? PLACEYeah. And there was like, you know, a lot of the folk singers, actually, were kind of critical of, you know, a lot of the U.S. labor movements, you know, not really rallying behind the civil rights movement, you know, thinking they should be. MCCLESKEYAnd you mentioned "We Shall Overcome" became an anthem. What are the origins of "We Shall Overcome?" Does it come from the labor movement or -- it's a freedom song, obviously, in the African-American tradition. Where does it come from? PLACEWell, like many of these songs, it came out originally of, you know, a religious piece. And, you know, there are some debate of which one it is, but there is a song called "I'll Overcome" by a guy named Charles Tindley. And there was another song called "If my Jesus Wills" different -- had elements of that. But I think it really got in -- I think -- got into the textile strikes in North Carolina as "I Will Overcome" is this first labor kind of manifestation. PLACEAnd again, the Highlander Folk School, that's where the founder -- the main guy at Highlander, his wife, you know, and there's Pete Seeger, Guy Carawan, to morph it into the civil rights song. MCCLESKEYWhat are your memories of the March on Washington in 1963 if you were there? Or perhaps, if you've heard some of the music since then, what songs really have stuck out in your mind over time? Give us a call, 800-433-8850. That's 800-433-8850. You can also send an email to kojo@wamu.org. You can also get in touch with us through our Facebook page or by sending us a tweet to @kojoshow. MCCLESKEYOne of the other performers that day, Odetta, of course, goes by just one name. Let's take a listen to Odetta's performance. She was singing "I'm on My Way" 63 years ago. And this particular piece of tape is from the WAMU archives. It was broadcast that day in 1963 here on WAMU. Odetta singing "I'm on My Way." MCCLESKEYWe'll talk more about the music and sounds of the March on Washington and take your phone calls just on the other side of this break. Stay with us. MCCLESKEYWelcome back. I'm Matt McCleskey, local host of "Morning Edition" here on WAMU 88.5, sitting in today for Kojo Nnamdi. And we're talking with Jeff Place, an archivist with Smithsonian Folkways Recordings, about the music and sounds of the March on Washington 50 years ago in 1963. Of course, today, many people gathering on the Mall for the 50th anniversary of the march. And, Jeff, you work for the Smithsonian. Your office is there on the Mall. You're not going into work today, I understand, because of the crowds. MCCLESKEYAnd we're very glad you were able to come here and talk to us. Let's go the phones now. Carlos is calling from Pembroke Pines in Fla. Carlos, glad you're listening there in Florida. Thanks for your call. You're on the air. CARLOSWell, thank you for very much for having me, and thanks for the show. And I just wanted to say that at the present time from 50 years ago, I think that I haven't heard anybody say anything about the present right-wing fundamentalism. That's making it difficult for people like -- they're regressing people back to abortion rights. CARLOSThey're making it difficult for gay rights. They're also making it difficult even for people to vote. So it's like I don't hear anybody addressing the issue of the right-wing fundamentalism that instead of progressing (unintelligible) in our history. MCCLESKEYWell, thank you for your call, Carlos. Certainly today, many people, I would imagine on the Mall, are thinking about some of those exact issues, and we did hear earlier from Jim Wallace, photographer, who is down there today about some of the different signs and issues that were being brought up. But we certainly appreciate your calling to raise those. I think when it comes to any issues of equality ongoing, a lot of those are the focus today on the National Mall. MCCLESKEYWe are gonna be focusing in this hour on the music and the sounds of the march 50 years ago, the March on Washington in 1963. You can call us, 800-433-8850, or email us, kojo@wamu.org, our website. You can also send a tweet, @kojoshow. We would be interested in hearing if you or your parents have the album of the day's speakers and performers, perhaps, or what music to you of that day 50 years ago stands out? MCCLESKEYLet's hear a little bit more of music. Now, this is not music from the March on Washington. But we're gonna hear something from a different rally, the SNCC Freedom Singers at an event in Atlanta in 1964. We're gonna look at some of the differences and how the music at the March on Washington might have been a little bit different from your normal rally, or perhaps, other rallies in the -- during the civil rights movement. Let's hear a little bit of that right now. MCCLESKEYOf course, beginning there with the call and response and then moving into "Oh, Freedom," one of the best-known freedom songs, of course. Jeff Place, the March on Washington on the Mall, did it have that call and response type of interaction between the stage and the audience? It was a much bigger stage perhaps than some of the other rallies. PLACEA lot of it was more formal. I mean, "Oh, Freedom" was played there by Odetta, I mean. PLACEBut, look, there were also performances which were like composed songs, which were done sort of a concert performance as opposed to like inclusive. Whereas a lot of these rallies, you know, the things, you know, on the South, people were actually, you know, the songs were sung in unison. People improvised lyrics. And one thing I do need to say is The Freedom Singers are really important in this whole thing. PLACEIt was a group of young people in their -- early 20s who became the song leaders and went around and composed a lot of the basic framework of a lot of these songs. MCCLESKEYYeah. Were they at the March on Washington as well? MCCLESKEYYeah. And did they perform? PLACEYes. That famous -- there's a famous photo of them. Everybody singing "We Shall Overcome" with linked arms -- Dylan, Baez. MCCLESKEYMm-hmm. Sure. Yeah. I've seen that. PLACEThe Freedom Singers are in the center with Chuck Neblett, Betty Fikes, Cordell Reagon and Bernice Johnson Reagon. MCCLESKEYAnd I imagine certainly the gathered crowd there on the Mall would have known the songs. And there would have some interaction at least, although with the distance perhaps it was a different type of rally. PLACEYeah. You know, it was -- the things were all worked into program. They had the speakers and, you know, and the rally people but -- and, you know, and some of the freedom songs were performed. But, you know, there were also things like Dylan doing "Only a Pawn," you know, "Their Game" and songs like that which are more, like I say, you know, a presentation. MCCLESKEYWell, we heard Bob Dylan that day, of course. And at that point, he was -- he's still considered a protest singer. He's gone through various mutations over the years and been known as perhaps a lot of different things. But what was -- talk a little bit about his involvement that day and what it meant for his career. PLACEWell, you know, I've read -- I was reading a book about Dylan recently where he's talking about, you know, the fact that growing up Jewish in, you know, in Minnesota. And, you know, he felt, you know, discrimination, you know, and tried and actually, you know, didn't even admit when he first moved to New York that he was actually a Jewish. PLACESo having felt that, he kind of like, you know, he sympathized with, you know, what was going with the civil rights movement. And at that point, too, a lot of the people around him in New York were very much -- there's a thing called Broadside magazine which he published songs in, which was like a movie graph -- like staple and a few pieces of paper and put out a lot of the early freedom songs are published in Broadside. MCCLESKEYI'd like to ask our listeners, are you a folk or gospel music fan? And what draws you to that music? Give us a call, 800-433-8850. You could also send us an email at kojo@wamu.org. Jeff, you were in elementary school at the time of the March on Washington. Where did you first hear the music from that day? PLACEWell, like -- my parents were like, you know, folk fans. It was during, of course, the heyday of folk music, you know, Peter, Paul and Mary and others. They took me to see Peter, Paul and Mary. I think the day of the rally, I don't think -- I probably wasn't really aware of it, you know, I was probably, you know, but they indeed had albums that had Freedom Singers on it. And, you know, they had the one "We Shall Overcome" record on Folkways and others. PLACESo, you know, it was all part of the repertoire of, you know, of the folk movement. So I heard a lot of these songs growing up, "We Shall Overcome," "This Little Light of Mine" and others. MCCLESKEYAs an archivist, I wonder how valuable you found audio recordings from the civil rights movement like other recording from the march. How are -- how valuable are they both to scholars and to musicians today? PLACEWell, I think audio recordings -- actually hearing -- if you read Martin Luther King's "I Have A Dream" speech, it's a lot different than hearing him say it. I mean, that it's -- that's so important, the whole way he did it. I mean, without the audio recordings, you know, you'll get half the experience, not even half. I mean, sliver the experience. So they're so key. MCCLESKEYSure. The delivery is so uplifting. PLACEYeah. Exactly. So, you know, and that's what makes it even, you know, more and more, you know, inspirational is hearing him, you know, when he said that. MCCLESKEYSure. And as an archivist, what's sort of things with -- from the civil rights movement have you worked with? PLACEWell, I mean, Guy Carawan, who was one of the people at the Highlander Folk School, we have a lot of his tapes at the Smithsonian, so I've worked on digitizing those. We've had The Freedom Singers over years at the Smithsonian Folklife Festival and actually got to sit down and talk to them, you know, sitting around a table, you know, Chuck Neblett and others. And here, there was different programs, so they talked about what it was like and why they wrote songs and how they use songs as an organizational tool to, you know, for the movement. MCCLESKEYWe've got a tweet from Tanya. She asked him, "Who was recording at the march in 1963? And how are these recordings preserved?" PLACEIt seems to me that what happened is news programs and news associations recorded a lot of what was going on. And they were put out on (word?) educational, kind of LPs, like the march on -- the one "We Shall Overcome" record was put out first by an educational company. So it'll be like if you recorded at news station nowadays, you know, and just had those tapes, and they were kind of compiled in this -- like these edited, you know, LPs that were released. MCCLESKEYAnd I noticed the CD that we had that we some pull some of these audio clips from that we played, the ones that weren't from the WAMU archive, it was two sides, and they didn't have individual tracks laid in there. It looked like it was an original -- originally released on LP. PLACEYeah. You know, it's actually -- there's a technical thing for that, too, 'cause a lot of times when you don't put the track breaks in, you can actually put more sound the side of a record. PLACEOn an LP, yeah. On an LP. PLACEYeah. You could actually make it a little longer. MCCLESKEYI was thinking CD for a minute, but I'm stuck in the present. Yeah. PLACEYeah, yeah. Exactly. Back when they first came out. But all sorts of people were putting out records. Even Motown put out a, you know, a Martin Luther King speech record. So there was a period where, you know, those things are out for people who wanted to have them at home. MCCLESKEYLet's go back to the phones now. Linda calling from Rockville, Md. Linda, you're on the air. Go ahead, please. LINDAYes. Hi. I had a question. I've been to a few immigration reform rallies. And, you know, obviously ,that's the civil rights (laugh) fight for our time, I think one of the important of civil rights for our time. And I've heard chants, and I know there's slogans and so forth that -- but I haven't really heard too much music that facilitated with the movement. And I don't know if I've just missed that or whether, you know, whether you can speak to that. MCCLESKEYThat's a good question, Linda. Thank you so much. Yeah. You often though do think about music so integrally with the civil rights movement. Do we see music integrated today with various different cause movements? PLACEWell, yes. Not as much as though, I don't think. I mean, I don't think that it's, you know, from what I understand about the civil rights movement, how that music was part of the whole process, it still gets more into the performance thing I was talking about. I mean, I know you go to, like, something like the Occupy movement. PLACEThere was lot of music, but it was people like, you know, Tom Morello and others going in and performing songs they've written for an audience and would sing along with them and chant with them. But it wasn't -- it was more internal to the whole thing, I think, with the civil rights movement. MCCLESKEYMm-hmm. Well, the tradition of protest music, of course, is a long and ever-changing one. We talked earlier about some of the labor songs and, of course, talking this hour about the civil rights movement. Where do you see the traditions of that kind of protest music carrying on today? PLACEWell, I think it's moved, you know, again, you know, I can't say I've been out in a lot of rallies, you know, but what I could tell, I don't think, you know, the sort of the singing along thing is happening as much as it used to, but people are still definitely writing it. And they're writing it in genres, which, you know, make sense to their audience. PLACEI mean, you know, it's not -- it's gonna be in hip-hop and that kind of music as opposed to, like, maybe a hymn, like it was in the civil rights movement. So it's still there, but it just, you know, you wanna put it in the style of music that your audience is gonna identify with. MCCLESKEYYeah. And hip-hop is certainly one current to today. Are there any others to you that come up -- you think about Rage Against the Machine perhaps? PLACEWell, yeah. (word?) Tom Morello, yeah. So, yeah, they definitely, you know, are doing stuff. There's people, you know, are still doing songs in sort of a folk manner. But, you know, I'm sure there's probably, you know, I haven't really delved into it. But, you know, talking about immigration, you would think there would be like stuff in, like, Tejano music or, you know, that kind of music where people are doing, you know, what they called corridos ballads, you know, about, you know, cultural events. MCCLESKEYAnd we've been talking with Jeff Place, an archivist with Smithsonian Folkways Recordings, about the music and sounds of the March on Washington 50 years ago. We also heard earlier in the segment from Jim Wallace, a photographer and former director of imaging and photographic services at the Smithsonian, who's photographs of the March on Washington can be found in the book "Courage in the Moment: The Civil Rights Movement, 1961-1964." Jeff Place, thank you so much for joining us. MCCLESKEYGlad to have you here. And we will bring you some coverage through the day, of course, here on WAMU and from NPR of the 50th anniversary of the March on Washington. You're listening to "The Kojo Nnamdi Show." I'm Matt McCleskey, sitting in today for Kojo. Thanks for listening.